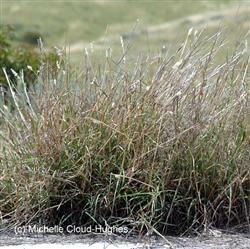 Cane Bluestem is a grass native not only to San Diego but also to Santa Barbara and even so far as Oklahoma. it is primarily used in revegetation, and is a very effective slope stabilizer. In landscaping it is desirable for its fluffy, white inflorescence, or as a component of a wild grass seed mix.